Multi-compartment, easy-organize pocket system. Rugged canvas with reinforced seams. Eight large pockets around top of bag, 16 medium pockets around middle of bag. Bottom designed to remain fully open when set down. Removable waterproof fiber bottom board. 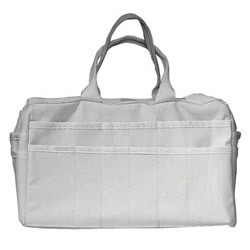 Type: Bag; Material(s): 15 oz #10 Cotton Canvas; Shape: Rectangle; Width: 16". Tool Bags from Alta! 83 In Stock today.